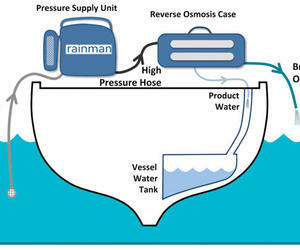 The installment of portable desalination units in coastal towns is a way for the Russian federation to help Cuba palliate the negative effects of the drought hitting the island-nation. During the 2nd Cubagua International Convention, the proposal to bring sea water desalination plants was made by Cubacon, a Russian investment consultancy firm. Its technical supervisor, Igor Masik, said they can provide Cuba with equipment made by AQUA-LIFE Ltd Partnership to be used to supply fresh water in coastal towns, agriculture, hotels and other facilities. They also plan to set shop in the Mariel Special Development Zone, as well as in Havana port and other areas of the country, he said. These plants are highly reliable, low energy consumers and can process up to 30 cubic meters per day. The setting of a manufacturing plant in Cuba aims at getting closer to the Latin American market, the only one they haven’t entered yet, after doing business in Europe, Asia and Africa. Officials at the Cuban Institute of Water Resources announced the first of this units, capable of processing 50 liters of sea water every second will be installed in Santiago de Cuba, one of the areas worst hit by the drought.